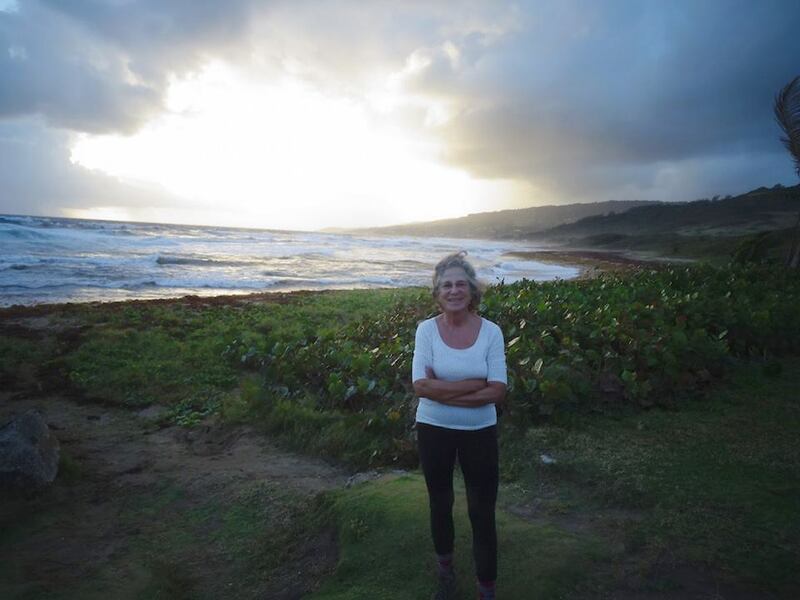 The thing that sticks in my mind about my drive down the South Coast of the Caribbean island of Barbados to the airport is the memory of the stench from foul, flowing, raw sewage, pouring down the road like spring runoff in the Arctic. My camera was in the trunk of my car, or I would have stopped to take a photo through the window. As it was, I just dodged the sewage collecting in potholes as I drove along . As on Arctic island, on a Caribbean island of only 430 square kilometres, you live with your waste—as is the case in Iqaluit where the city’s sewage lagoon steams even in the coldest days, not far from town, or in Cambridge Bay, where the landfill’s sewage lagoon is close enough that you can ever really forget about it. But in Barbados, where a lot of the waste has been traditionally either locally dealt-with by “pit” latrines dug in the ground, cesspools or simply by sending it into the sea, today’s sewage system on the populated South Coast isn’t working and hasn’t for more than a year: that’s due to faulty equipment, bad maintenance and misuse by users, who flush towels and grease into the system, government officials maintain. Conditions are so bad that some school children have been transferred out of their school. The post office and some businesses closed, the United States issued a “water warning” in late January, and many long-time visitors to the island, whose main economy is tourism, have said they won’t come back due to the polluted water, beaches and streets. 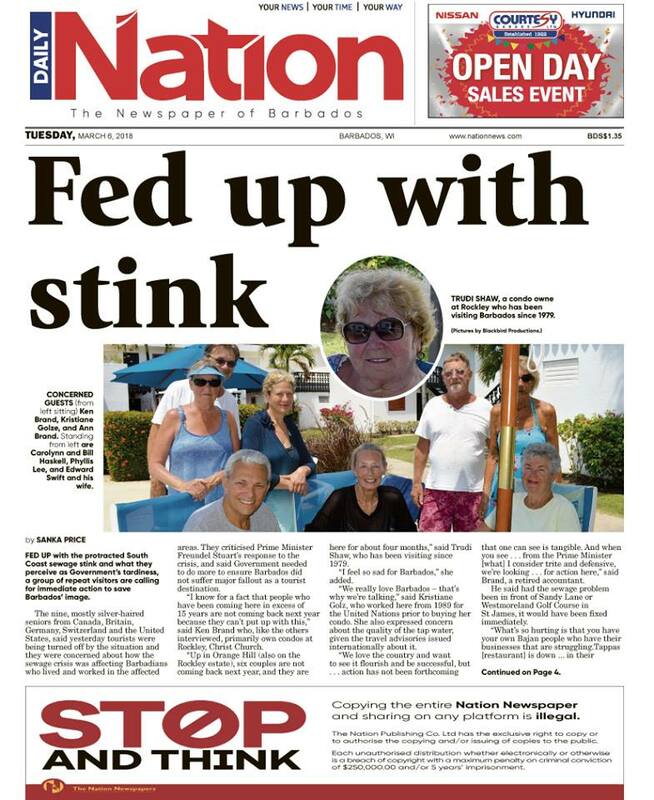 I’d like to sum up the current Barbados government’s lacklustre response to the sewage crisis as inadequate and unproductive, although you could say the same has been true in Nunavut with respect to maintaining water quality in some of the territory’s communities, which regularly have boil water advisories posted. I could make a list here of the shared challenges between Barbados and Nunavut that both struggle with in providing even the basics to their citizens: clean water, solid infrastructure and safe living conditions. 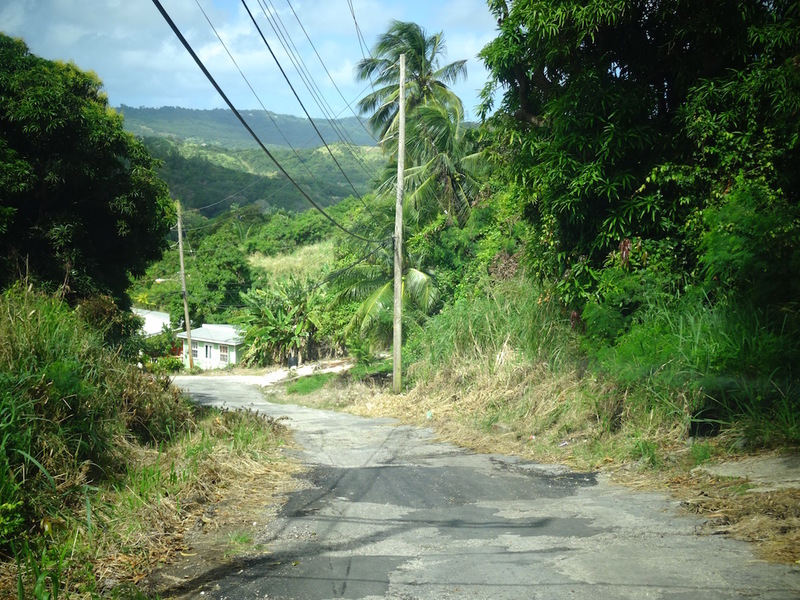 While spring brings potholes in Iqaluit, the poor state of many roads in Barbados just remain bad all-year-round—and there’s no money to fix them. This is the state of the road leading up to a community called Chalky Mount. But I think waste disposal—which I mentioned in a 2016 posting— remains near the top. This year in the parish where I stayed, there was only one working garbage truck for thousands of people who would neatly pile up their plastic bags by the cans and wait and wait. 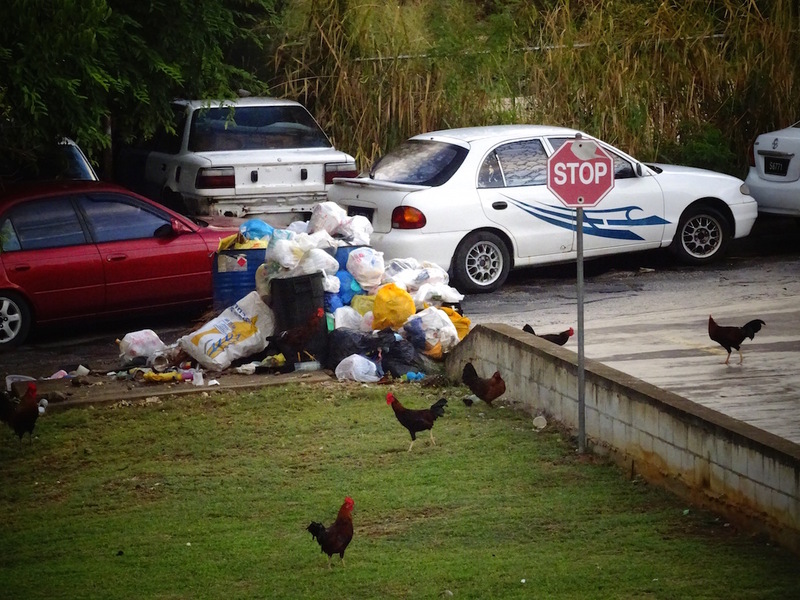 By the time the truck passed, chickens—the Caribbean’s versions of the Arctic’s ravens— would have torn up the bags and litter would be scattered around. As in Nunavut, there’s no public recycling program on Barbados. Here’s how the garbage looks before it’s picked up, a sight that’s repeated elsewhere on the island. This year, I also saw a lot of illegal dumping on the land. We’d be hiking through a field of sugar cane and all of a sudden we would run into an entire living room suite that had been thrown out or a bunch of kitchen appliances, or often, bags of clothes. I took photos of those dump sites on my weekly hikes but then my phone was stolen as it dropped out of my pocket when I crossed the street and someone swooped it up more quickly than I could retrieve it. I actually wrote about that this year in the Nation News, the island’s popular tabloid daily which in many ways reminds me of the Nunatsiaq News—although many locals are reluctant to address problems head-on in their media, due to possible repercussions, or, some suggest, the cruel legacy of colonialism and racism in Barbados, which suffered from slavery until 1834. Not that petty crime is just a Caribbean phenomenon: if you look at the Iqaluit public service page, you’ll see lots of people looking for their stolen phones. Another similarity: climate change here and there, which I looked at in a 2015 post and again in 2016. In the Arctic, this means shrinking ice and unpredictable weather in the North. 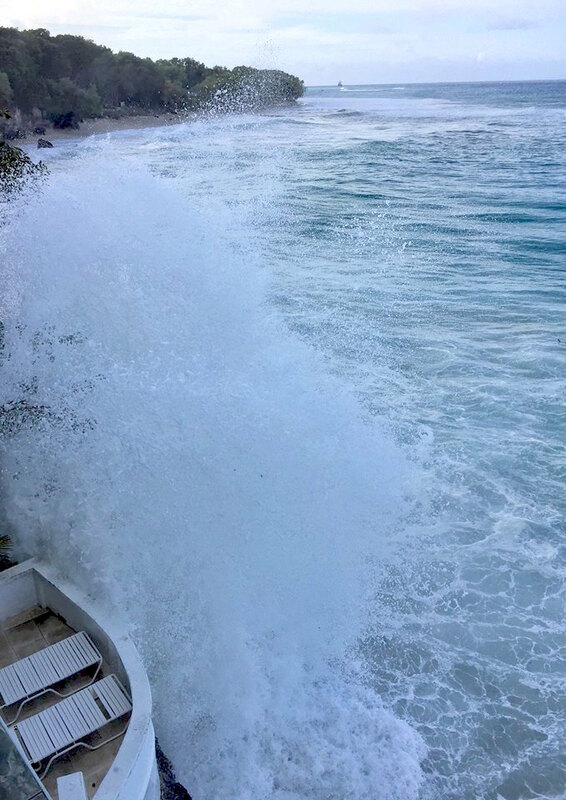 In Barbados, this year it meant wet, cool weather over this past winter and then giant waves early in March, which ripped into beaches, poured into restaurants and made it hard for people . not to mention sea life like turtles and fish. I didn’t take this photo—but it shows how on March 7 the waves were splashing up 40 feet against houses on Batts Rock. So, those are the commonalities. But Barbados is way ahead of Nunavut in terms of tourist numbers, with at least six cruise ships a day coming in to port. But where does their trash go? How about the black carbon their exhaust spews out? And how much money do the cruise ship visitors really leave behind? 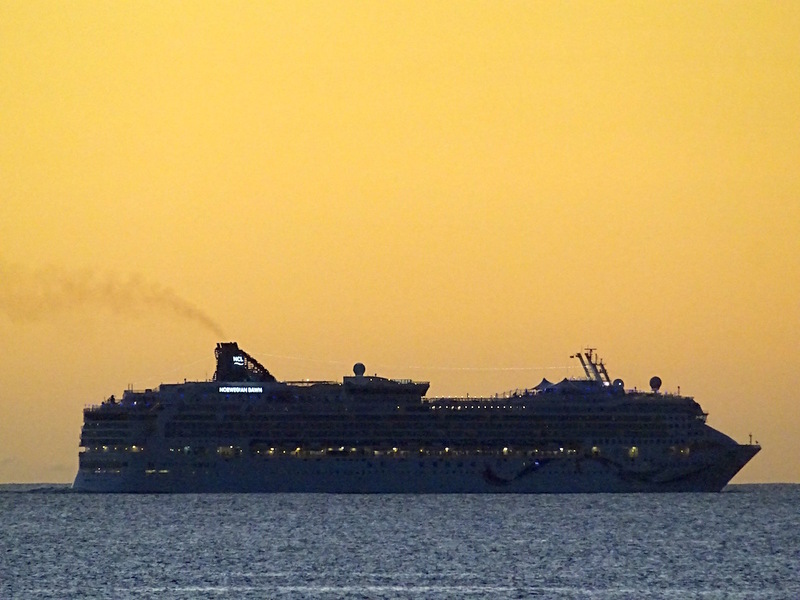 Here you can see the dirty exhaust spewing out from a cruise ship heading away from a stop in Bridgetown. Yet there remains one big positive difference between Nunavut and Barbados. In Nunavut, there’s much more control over development. 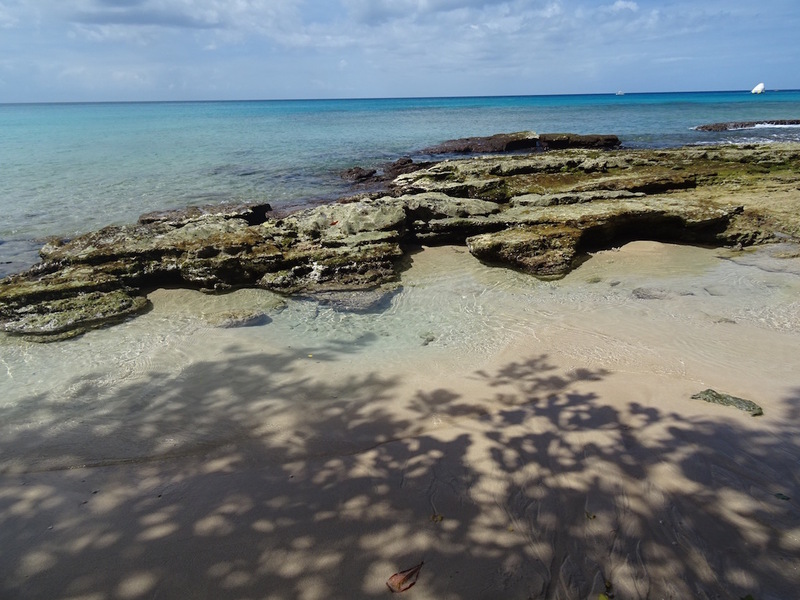 I went to a public consultation in Barbados for a project that would see a local beach torn up to make way for the construction of a water park and “family” resort. It’s a development that would have seen a big Nunavut Impact Review Board meeting where members of the public, the project’s proponents, experts and government officials would have looked at all impacts on the water, land, people and wildlife before judging the project worthwhile or not. 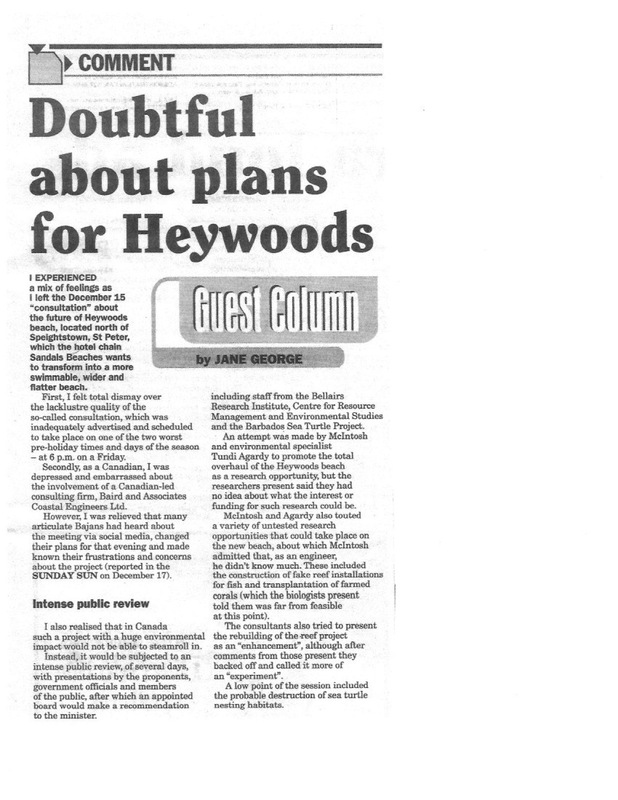 Beautiful Heywoods Beach, slated for improvements to make it more tourist-friendly. But in Barbados the so-called consultation was held on an evening when nobody wanted to go, and it was poorly advertised, with no documentation available. Members of the public and local experts were sidelined. You can see some of what I wrote for the Nation here. So, you might think what—she’s writing again about the Arctic and Caribbean? But here’s a photo of the Arctic coast outside Cambridge Bay and the Atlantic Coast of Barbados’ East Coast which a friend in Cambridge Bay picked out for their resemblance. I’ll leave you with that. I’m waiting at Barclay’s Beach to meet up with my hiking group. 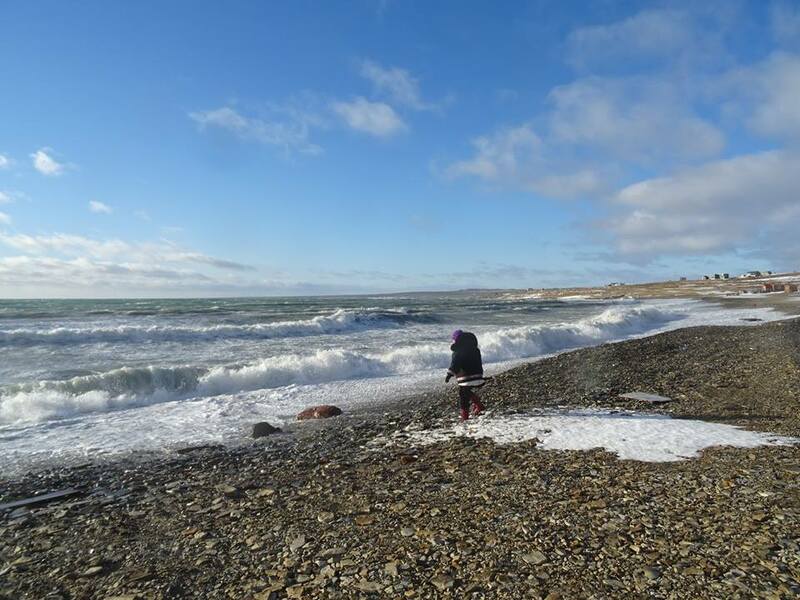 In the other photo, you can see my friend on a similar-looking beach, outside Cambridge Bay in western Nunavut. Thankfully there is a new gov’t now, which seems willing to truthfully deal with these issues. It saddened me to see how in the past few years such sewage and garbage problems were left unattended. Swamps filled in for housing or allowed to be garbage dumps because the former govt refused to pay salaries etc. Praying we will pit a stop on the slide and deal with these concerns. We can always hope!! Thanks for your comments.